The Craft Barn Calendar prompts for July are Turqoise and Beach Huts. I wanted to use my beach image stamps from Rubberdance, and decided to limit my use of colour so I could also post for the Rubberdance July challenge (vintage white, forgetmenot blue, cinnamon brown). As can be seen from the result, the blue colour is somewhere between turqoise and Forget-Me-Nots, but I think the compromise is ok... anyone can claim the computer screen changed the colour! I stamped my "photo" with a couple of brown Versamagic inks. Rubberdance sells these on a sheet with some lovely shells, but I one this in a grab bag, and I don't have those separate shells. I stamped the shell corner of the stamp a few extra times and fussy cut the shells. 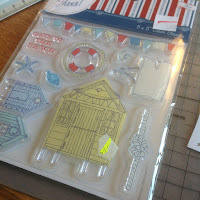 I was a bit worried what to do about the beach huts, wondering if I really ought to order stamps... And the I ran into this set going half price in a craft shop we popped by... bought it, even though I try to avoid clear stamps. Besides, I'm working on three calendars, and I can use the big hut on another one. I used the sentiment and the two small huts, heat embossing the huts with white and placing them so that with the "photo" in place it will look as if there is a row. I coloured some parts with a white sharpie. The shells were burnished from the back so they became a bit round and fastened with glue dots. No calendar grid for July yet, as it will be behind the August page -June is on the back of this one, and I'm updating a photo of it on the June page. Update: done the calendar grid for this page, I embellished it with some stamps from the clear stamp set I used for the beach huts. The previous pages of this scrapbook style calendar can be found here. This is so very elegant - the white embossing looks awesome in the background and just gives a little extra sophistication. Thanks for joining us at Rubber Dance. Beautiful card, Kristiina! I love how you stamped the whole image over again and cut out just the shell - great idea! Thank you for entering our July challenge once more! Very pretty!Thank you for entering the Rubber Dance Challenge. Hugs, Susanne. A beautiful page. I love the soft tones you used have used.